People knowing the recycling potential of wood can’t let the old and retired types of wood go wasted! To make you fall in love with recycling of pallets, we are having here a big list of items to make with old, useless and retired types of wood like pallets! If you are passionate about keeping pets, then pallet-made dog bowl chest and a chicken coops given below may the ideal pieces to give yourself a big helping hand, get yourself amazed with the given examples below! Let your kitchen interior be more functional and great with pallets, reclaim pallets to build awesome trash bins and also provide protection and a damn rustic wooden touch to your kitchen wall by going with pallet wood wall cladding as shown below! Going through laundry storage problem? Build custom storage units with pallets like given laundry basket dressers, also integrate removed pallet pieces to build simple small or large frames, the bigger ones can be hired as inspiring headboard pieces while mini ones can be got for amazing festival decors and wall signs out of them! 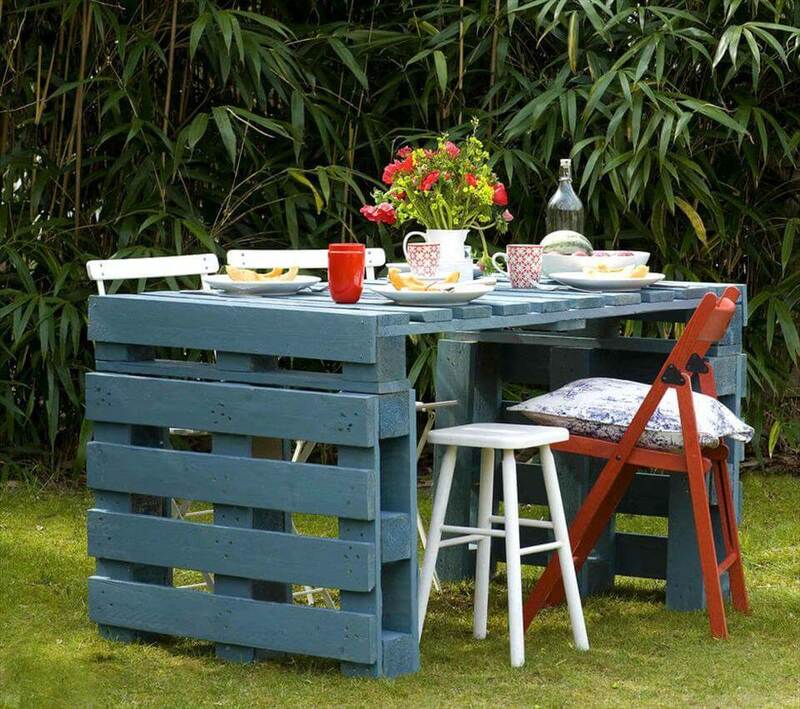 Gather hole pallets for amazing garden party lounge and also frame up single pallet slats to install folding and adjustable table lamps, get inspired of cool examples given below! A complete solution for feeding your dog is all waiting for you here, a small storage chest has been build with pallets the lid of it comes with two steel bowls installed precisely! The owner can store the dog food inside of it easily! It has been personalized with a wooden dog-bone simple mounted on front! Plan single or separated pallet pieces for amazing festival wall decors, here a precious one has been given which is composed of 4 pallet slats put together as plan wooden boards! This board has been painted in white, embellished with stars accents, baubles, tree branches and with lights for a gorgeous appeal! 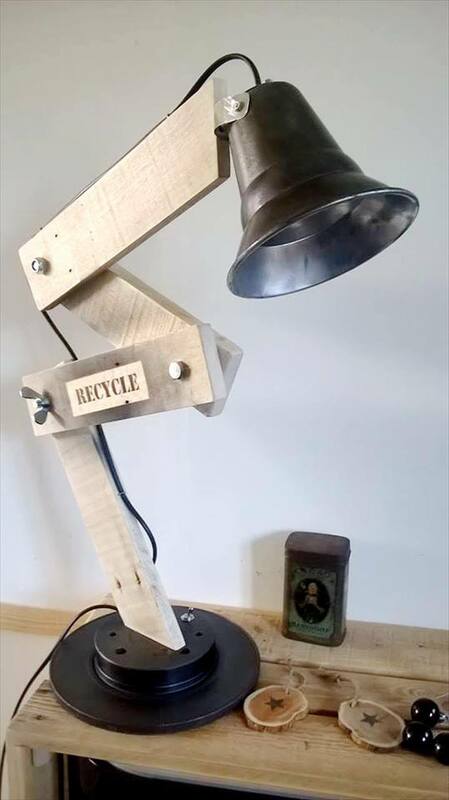 Combine a few of pallet slats through hardware to build this folding wooden base of a desk lamp! Nuts and bolts formulation has been done to create movements of different parts of this lamp! 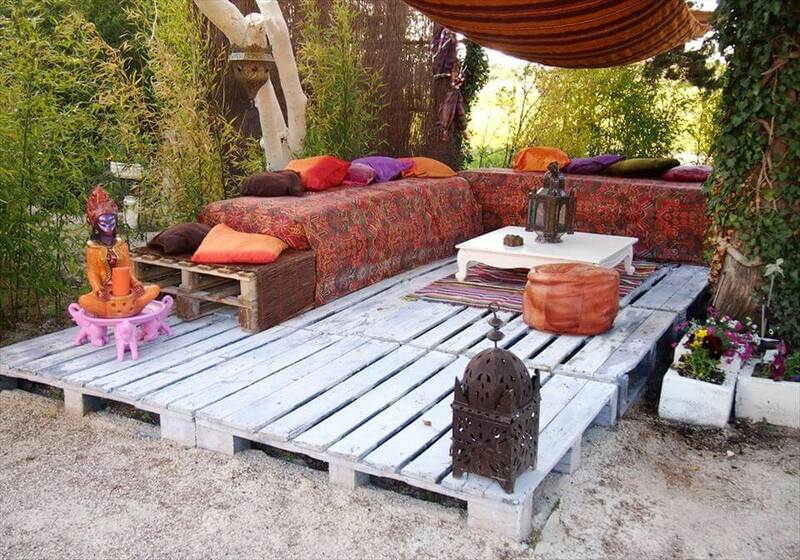 Here is a garden party lounge made of pallets, comes with pallet floor, a cushioned L-shape sofa installed by making the pallet stacked simply and also with a coffee table! A full setup to go also for bigger outdoor guest entertainments! 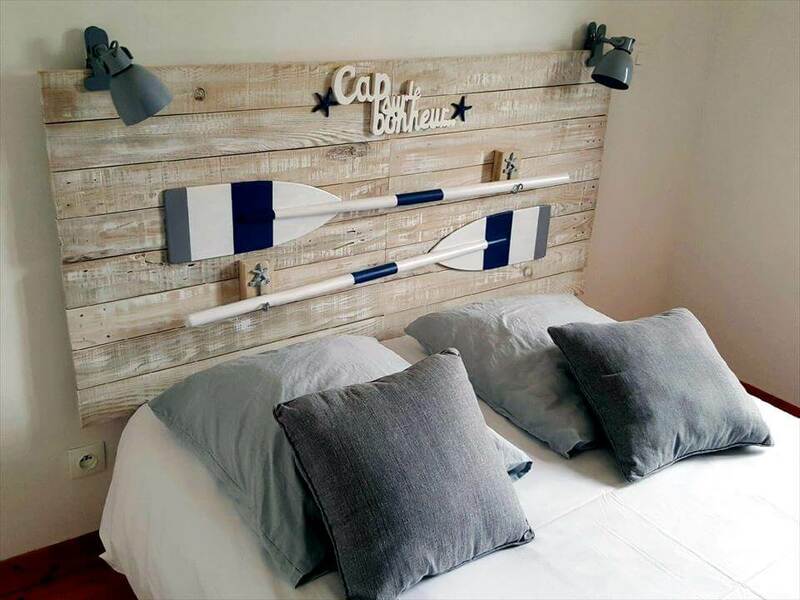 Here flat rectangular boards serving as a headboard, is all made of pallet slats and comes with lights, custom name letters and 2 well mounted boat paddles! The paddles accents make it inspired of coastal decors! Need to provide a graceful wooden touch to any of your interior wall area along with extra protection, the pallet wall cladding would be best suiting option for every home lover due to budget-friendliness, highly stability and glam rustic wood tone! 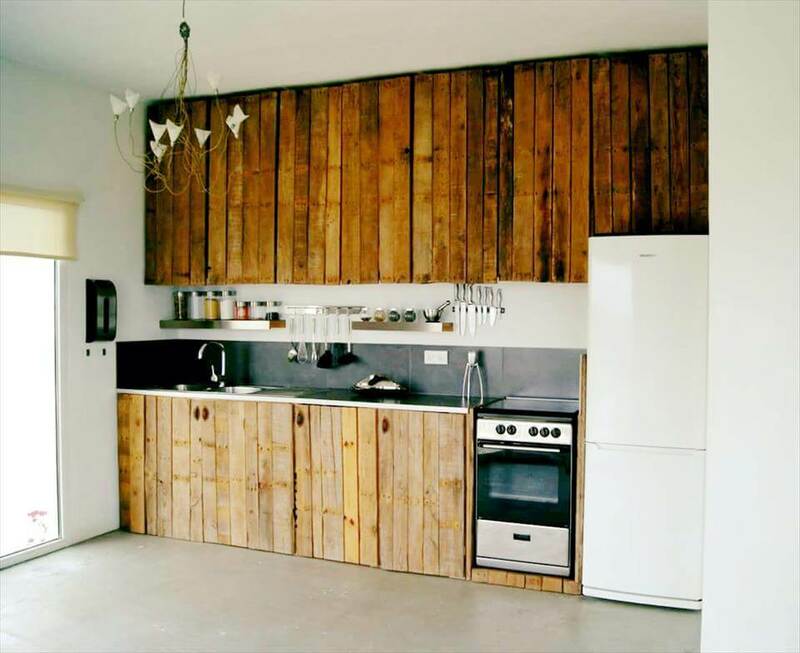 Here a few of kitchen walls have been brought to prominence through pallet wall cladding! 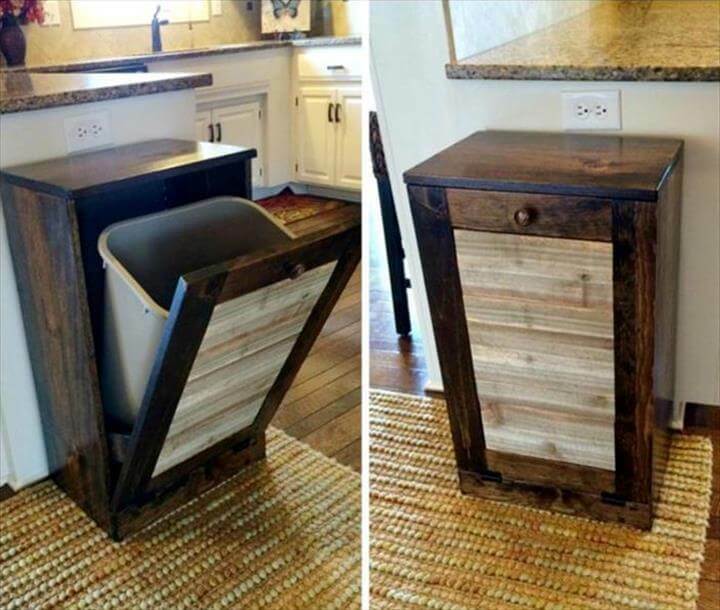 Trash piles are not going to be appreciated ever in anyway, we always use trash bin to neatly remove the trash from every single room, pallet-made trash bin holder can be a bigger help to make you home look clean as they can really hold well you trash bins full of trash and can also open them for convenient storage of trash as shown! Here is a free wooden laundry basket organizer, installed with pallets and is having a clever composition, all done with dismantled pallet boards! Wheels have been added to drag it easily while being full of stored of clothes! 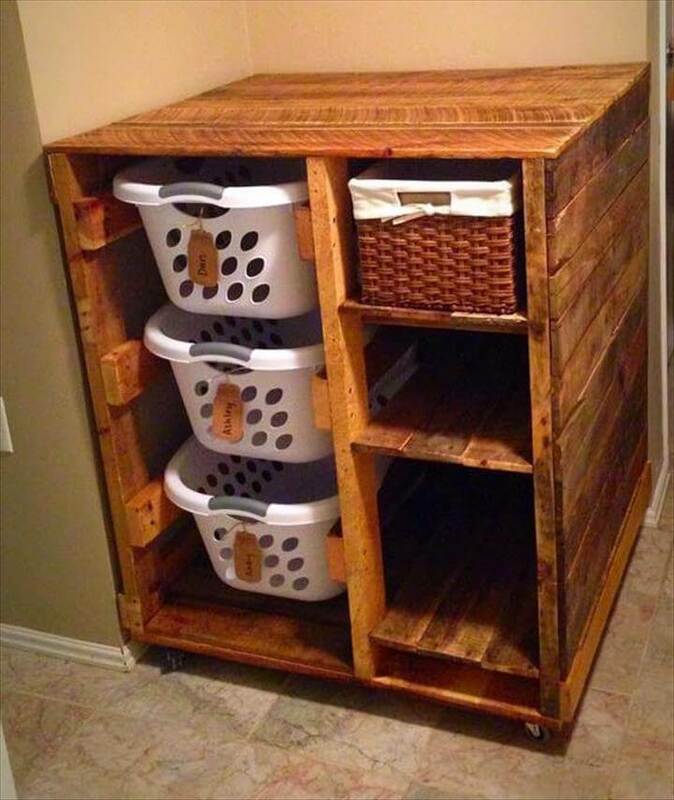 Boost the functional look of your laundry with pallet wood ideas! 1 modified and 2 complete pallet boards have been merged together to yield this outdoor picnic table which can also be an outdoor dining table for 4 peoples! It has been painted in dark great to look focally attractive and stimulating! Here is a precious chicken coop having shingled sides, entirely structured with pallets and has an incredibly functional features! Comes with a tilted roof and mini with mini stairs installed to primary entrance! Final reddish tone of wood has been created by applying red mahogany stain coats which also make the wood weather-proof!